What’s funny is that when I first looked at the picture, I was like what’s so special about this house?? Hilarious… then, I looked up and my mouth just dropped open. Man, what do you even say to that, hence just posting the picture, right? Wow. Very moving words to accompany this shot. Wish I knew more about the house, but sometimes mystery is better. interesting composition here..like the top of the photo..
Hello William Egglestone ! What a great work you have here!! i’ll be back! Paul is right I think it does remind me a bit of Eggleston – especially the colors. 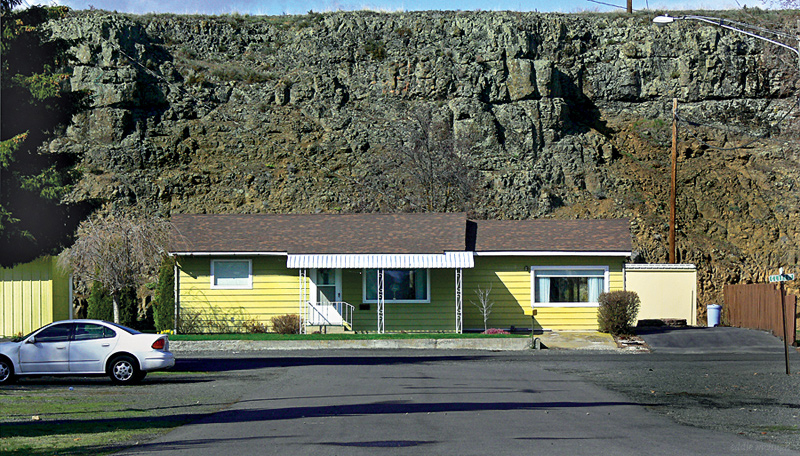 The contrast between the lowly house and the rock of ages in its backyard is thought provoking. And then there is the wonderful everyday aspect of the house – Anyway great shot. i guess it was built in a nice place, i hope no rock falls from that mount! !